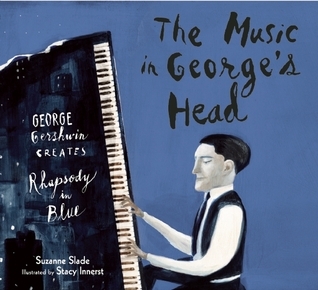 George's Rhapsody in Blue was smooth and sultry. No one had ever heard anything like it. He'd been hearing beautiful music all his life. As a youngster, beautiful is certainly not the word I would have ever used to describe George Gershwin's Rhapsody in Blue. But just as my palate for different, more sophisticated foods has expanded as an adult, so too has my ear for music. Now instead of groaning every time I hear the introductory shrieking notes of the clarinet that signals this piece of music, now I just smile, sit back, and enjoy this 17 minute piece of Americana. The moody blue palate of the illustrations are somehow both brooding and uplifting at the same time. I thoroughly enjoyed reading this book. And if you are not familiar with this brilliant piece of music, take 17 minutes out of your day and go fix that problem right now. I'm actually listening to it as I write this review because I was tired of it being stuck in my head. I may as well just listen to it outside my head.